Your family dentist in Ocala probably reminds you all the time how important it is for you to floss. Yes, grown-ups need to floss daily in order to achieve optimum oral health — but so do children. Even though their primary teeth will fall out eventually, it’s still vital to get kids into the habit of flossing. Helping them floss every day will play a role in preventing cavities and sparing your little one from excessive pain and dental work. 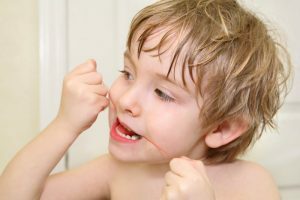 But when should you start flossing your child’s teeth, and how can you do so effectively? Before a child has teeth that touch each other, flossing isn’t necessary; a brush should be able to reach all of their tooth surfaces just fine. However, as more teeth come in and they begin to fit closer together, the danger that food and bacteria will get stuck between them increases. Therefore, the ideal time to start flossing your child’s teeth is whenever their teeth start touching each other. This usually happens around age two. If you can’t tell if it’s time for you to start flossing your little one’s teeth, try a little experiment: Take a piece of floss and insert it between two of their pearly whites. If it sticks a bit, then you know that it’s time to integrate flossing into the daily routine. Use a floss that is the right width. A floss that is a bit thicker and softer than grown-up floss might be best, depending on how the child’s teeth are arranged. Be gentle, always taking care not to snap the floss between their teeth. Don’t worry if their gums bleed a bit; this is normal at first. Your child might find flossing uncomfortable, so be sure to have a positive attitude about it. Educate them on why it’s important, and always give them plenty of praise when they demonstrate that they care about their oral health. If you have questions or concerns about flossing your baby’s teeth, ask your children’s dentist in Ocala. They’ll be happy to give you personalized tips for making the most out of your little one’s oral hygiene routine. After a few years, your child should develop the dexterity to start flossing on their own. As a general rule of thumb, if a child is old enough to start writing in cursive, they’re old enough to floss their own teeth. This usually happens between the ages of 8 and 10, but it may happen even sooner for some kids. Flossing is important! We hope these tips have inspired you to help your child adopt this tooth-friendly habit. Dr. Daniel Weldon is proud to serve as your dentist in Ocala. He enjoys working with entire families and would be happy to help you teach your kids to have great daily dental habits. If it is time for your little one’s next checkup, please contact our office at 352-622-3236.